Spring Flurries – Maine. Ocean. Camping. Topping the list has been planting the new fruit trees Steven picked up in Waterville last Saturday. A very long time ago we pledged that we would never cut a tree without replacing it. This year we’ve planted four heirloom apple trees, two flowering crab apples, two heritage plum trees propagated from a homestead in Stonington, two cherry trees and nine varieties of high bush blueberries. In this photo, two of our greatest guys, Chris and Mario are helping Steve after school today plant a flowering crab across from the little guest cabin. The Daffodils are blooming everywhere you look…did I mention that once I thought it was a brilliant plan to save money by buying Spring bulbs 500 at a time? 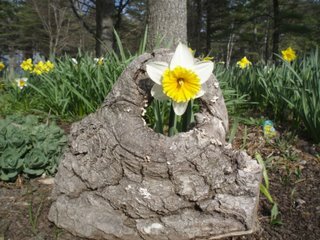 This one is in our central garden, poking through an old gnarly stump we recuperated from the time we were sawing the logs for lumber. Sprucing up in the Springtime always means painting in every imaginable form. 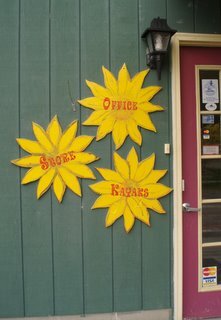 We’re waiting another week or two to start the buildings and trim but I got a head start on these signs. Last year I saw these daisies in a French magazine…the photo spread was about a spring wedding and the flowers were painted delicate shades of white and pale pink. When I showed them Gary, an innocent camping guest, he politely asked me how many I wanted. A few weeks later he drove over with six cut outs, ready for a paint job. Aren’t they marvelous? 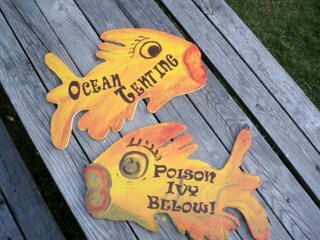 Later in the summer, while we were chatting I showed him some paper scribbles of fish cut-outs I knew would be wonderful in the park…he took the hint and this year they’ll swim through the park. Consider this fair warning if you ever think about offering to help. I have a very long memory and as I’ve said 100 times before, our park wouldn’t be special at all if it weren’t for the wonderful guests who contribute their talents for everyone’s enjoyment. Tomorrow Dad and I head to Bangor for Clean-up Weekend supplies, general errands and to pick up a new rental trailer. The decision has been made, I’m going to fry homemade doughnuts Saturday morning for our clean-up guests. I’ve figured it out and I can make the dough at 6:30, start heating the oil at 7:30 and I should start cooking at 8:00…what a fun way to start the morning! I’ll have sugar and chocolate frosting for dipping the doughnuts (everyone can dip their own) and strong hot coffee. Then we can use the morning’s oil for homemade french fries at lunch…hopefully they’ll be the sweet potato variety if I can find them in Bangor. Next Wish you could have been here!